I woke up this morning thinking about making pumpkin pie bars. I’ve never made anything quite like this before, but Phil has been asking for pumpkin pie for a month now and I’m one of those people who only bakes pumpkin pie for Thanksgiving and Christmas. To me it just seems wrong to eat it any other day of the year. But these are slightly different than pumpkin pie and they satisfied his craving without me having to break tradition. I’m calling these pumpkin cheesecake bars because they are made with cream cheese, but the texture and flavor is much closer to pumpkin pie than cheesecake. If you don’t love pumpkin pie, you won’t love these. But if you do, you should probably make these really soon. Like tonight. I used my food processor and stand mixer for this recipe, which means cleanup was a bit more intensive than I like, but you could easily do this without either of those machines. The buttery brown sugar shortbread crust pairs really well with the pumpkin cream cheese filling. Pre-baking the crust helps it stay nice and crisp, unlike pumpkin pie crust which has a tendency to sog up a bit. Use the best butter you can find in the crust – I used Kerrygold and the flavor was outstanding. I had planned on delivering half of these to the painters who have been working at the new house but as of this afternoon the virus that has been threatening to take me down for the past week is finally winning. So, I decided to stay home rather than spread it around. Anyone else dealing with body aches and a headache that makes you feel as if your head might actually explode? I guess I’d better stop baking desserts and put a pot of chicken soup on the stove instead. Preheat oven to 350 degrees. Line 9x13 pan with aluminum foil, leaving enough to hang over the sides of pan. Coat foil with cooking/baking spray. Make the crust: Combine flour, sugar, and salt in the bowl of a food processor and pulse to combine. Add butter and pulse until mixture resembles coarse crumbs. Pour crust mixture into prepared pan and press evenly and firmly into the bottom. Bake crust on the center rack of preheated 350 degree oven for about 15 minutes or until just starting to brown around the edges. Remove from oven and set on wire rack. Meanwhile, in a large mixing bowl, beat cream cheese and sugar until creamy. Add pumpkin, eggs, vanilla, and pumpkin pie spice and beat until well combined, scraping sides and bottom of bowl a few times as you go. Pour pumpkin mixture over the pre-baked crust and smooth the top with a spatula. Bake 25 minutes at 350 degrees. Let cool completely on a wire rack then refrigerate for an hour or until thoroughly chilled. To serve, use the foil to remove the entire dessert, then slice into squares. Leftovers should be stored in a covered container in the refrigerator. If you choose to use salted butter rather than unsalted, omit salt in the recipe. I tested this recipe with kosher salt. If you use table salt, use a little less than 1/4 teaspoon. If you want to avoid using the food processor, cut the butter into the flour mixture using a pastry blender or two knives. Or just cut it into small pieces and rub it into the flour with your fingertips. I was just wondering what to take to a lunch thing next week.....and now I know! Amazing - yet another awesome pumpkin recipe for me to try! Ummmmm brown sugar shortbread crust? YES PLEASE! I just love both pumpkin and shortbread! What a perfect combo for this season of thanksgiving and autumn! These are seriously delicious. There's just the perfect slight amount of salt to complement the sweet, and the crust is soooo good. I think I like these even better than pumpkin pie. I need more. MORE, I SAY! Awesome! By pure luck I just picked up all of these things on my last shopping trip! This sounds yummy, but I was wondering what size of canned pumpkin did you use? Lil - Just a regular 15-oz can, not the large one. Thanks for asking... I'll update the recipe now! I saw these on FPD yesterday, and they look so delicious! Perfect for Thanksgiving! 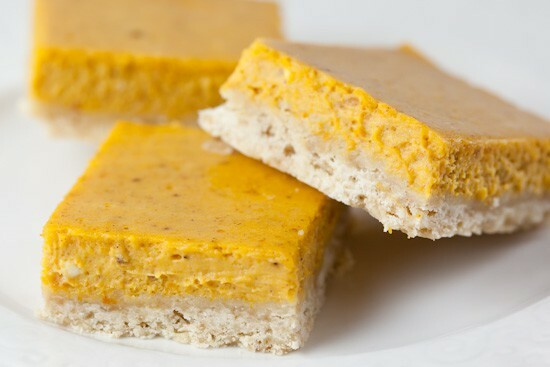 Never thought to put the flavors of shortbread, pumpkin, and cheesecake together! But they are all so delicious, this recipe hits it right on the head! My wife made these over the weekend and they are outstanding. Thanks for a great recipe! I look forward to making these! Hopefully my immune system will kick the but of whatever virus *I* have that is making me feel like my head will explode. Not sure how you manage to cook sick. All I can manage right now is soup and tea. Have you had any luck making these in advance and freezing them?